07.04.2012 - Oltchim Râmnicu Vâlcea undone by return-leg hurricane. 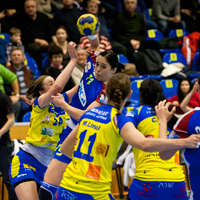 05.04.2012 - Preview of the two second leg semi-final matches of the EHF Women's Champions League. 01.04.2012 - Oltchim wins against Győri Audi ETO by four goals difference in a hot clash in the EHF Champions League semi-final.